My favorite camera reviewing website, Dpreview, has posted their very thorough review of the Panasonic Lumix DMC-GH1 camera. This Micro Four Thirds camera has some very interesting video modes so it will be interesting to hear what Dpreview has to say about this digital camera. Dpreview ends up giving the Panasonic Lumix DMC-GH1 camera a “Highly Recommended” rating as the camera is able to produce pictures of high quality, have good resolution, excellent electronic viewfinder and the movie mode is very nice. The only downsides are a bit of highlight clipping, the electronic viewfinder can be hard to use in low light situations and the price on the camera is pretty high. Overall this Micro Four Thirds camera from Panasonic seems like a real winner and I would definitely considering buying it if you have the money. 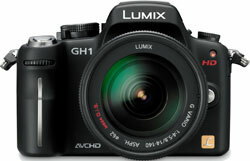 Read the full review of the Panasonic Lumix DMC-GH1 here.